Congratulations! You've discovered Kamaole Sands, the best holiday complex in Maui. Now you have found one of the best units in the complex! 1. Large Lanai-Far fewer than half the units in Kam Sands have a large lanai. Settle for nothing less! 2. Privacy, Privacy, Privacy-Most units have your neighbor looking onto your lanai. Not here, no one looking in from the side or garden area. 3. Bright-Let the sun shine in or enjoy the lights at night. A bonus side window enhances the suite with light and views. 4. Quiet-Situated on the 3rd floor at the end of the building, you have relief from elevator noise, odd hour arrivals and departures, and from the pool and tennis. 5. Close, Yet Quiet-While avoiding the noise from everything, this unit is less than 2 minutes from the pool or tennis courts and as close to the beach as most buildings. 6. 'A' Rating. Gourmet kitchen, new carpet, large tiles, upholstery, paint and king bed and two flat screen TV's. Brand new H/E Washer and Dryer. A/C in the bedroom and living room. Also, ceiling fans in these two rooms. 7. Competitive Rates-Price competitive with lesser rated units. 8. Ocean View- Great view of the Pacific Ocean, Ma'alaea Bay and north half way to Lahaina where the West Maui Mtns. meet the Pacific Ocean. Sunset (winter months) and ocean view from the front entrance breezeway. 9. Internet- Bring your lap top, our unit provides free WiFi. 10. Fully Equipped-We've gone that extra mile to make your holiday an enjoyable one with a new Westin King, Heavenly Bed, well equipped kitchen, tennis racquets, thirsty beach towels, beach chairs,umbrella and much, much more. You're Going To Love It. Call Us Now! Keywords: Condominium, free parking, w/d, near Kam 3 beach. We love Maui. it has the best weather in the world, world class beaches, is the perfect size plus the friendly Hawaiians, locals & culture make it a safe haven for a lengthy or short tropical vacation. It is absolutely perfect. We holidayed in Maui for 30 years, the first 15 in Kaanapali and the last 18 in South Kihei at Kamaole Sands. Over the years we stayed in almost every building at Kam Sands assessing the features and benefits of each. For many years we traveled with our children, now it is just the two of us with the exception of wonderful visits from our kids. We chose our suite because of the large lanai, the ocean view and the privacy. We now winter for five months in our renovated Maui home and know we made the right choice, we love, love. love it. Third floor, end unit with an EXTREMELY private lanai (deck) with an ocean view over Kamaole 2 Beach. A rare bonus extra (end) window where sunset colors that light up the sky can be enjoyed. We're situated a convenient but quiet distance from the elevator, garbage chute , barbeques & electronic car gate. Each bathroom completely renovated with walk in glass and tile showers, new marble vanity tops, new seat height toilets, vessel sinks and all new fixtures. Kahalui which is about a 25 minute drive you will find a Macy's mall, Marshall's, the airport, Costco and Wal-Mart plus other box stores. One large pool, two hot tubs (one is for kids only) and a kiddies pool. From our lania (deck) you look west over Kamaole Two Beach and a great ocean view beyond. Kamaole 3 Beach is directly across the road. West Maui Mountains off the lania and Haleakala from our breezeway at the front. from our lanai (deck) looking west you see the whale watching boats from Ma'alaea Bay, outriggers, paddlers and even whales off Kam two Beach. From our door to feet in the ocean is a safe five minute walk. Owner provides enough toiletries, TP, paper towels, detergent, etc, for a few days only. There are many stores nearby to restock. A/C in both living room and bedroom plus ceiling fan over bed and in living room. in the unit, There are also hooks on the lanai (deck) for hanging wet towels and bathing suits. Supplied by owners. There is a washer and dryer for use during your stay but housekeeping will change up upon departure. Drip method with filters. beans and grinder enough for the first few days. Some miscellaneous items kept fresh by our on island agents. Bring your own Apple TV if you like to hook into condo TV. Several books left by us and previous guests, plus there are books at the pool library. Ping Pong table in the pool area. Called a lanai in Hawaii. Ours is large and very private. Towels and chairs in suite. Bikes available to rent nearby, with bike racks near the registration office. Called a lanai in Hawaii. Ours is large, private and has a table, chairs and chaise lounge. Two Tommy Bahama beach chairs and a beach umbrella. Cooler and ice packs. Four courts on property. Free to guests. With a tennis pro offering free clinics each Thursday AM and private lessons upon request. Sign up at front desk. Many amazingly beautiful with varying degrees of difficulty nearby and on island. Large outdoor pool shared by the guests and owners of Kamaole Sands. Large pool with many chaise lounges, umbrellas, some tables and chairs. One for adults only and one for kids. In addition to being fully renovated with adult guests in mind, the lanai is large, quiet, extremely private with an ocean view that never tires. It is your home away from home with nothing left to chance; we've thought of everything. Thank you for sharing your home with us. It was hard to leave. The view from the lanai is awesome and we enjoyed eating all our meals there, especially morning coffee. The bed is super comfortable and having an extra bathroom was a bonus. I usually bring spices oil etc, but your kitchen was very well stocked. Having the chairs and umbrella were so handy and enjoyable at Kam III. The grounds for the complex were well-maintained and beautiful. We truly didn't want for anything. This is our winter home, it is not just a rental so we have everything and more for our guests. You want it, I guarantee it is here. Each year we add and update; this year we bought a new lanai/patio set plus a chaise lounge so that many afternoons, after a busy day at the beach one could lounge and read. Like our first home, our Maui home receives the love and attention it deserves so it is always guest ready. Our island Agents live nearby to assist with most things and the friendly 24 hour registration desk is here to answer most questions no matter what time you arrive. Our "wanting for nothing" condo is sure to delight you, we love it five months of each year, we're sure you will however long your stay. Absolutely stunning! Can’t wait to return! The condo was beautiful and the view was great. We ate breakfast on the lanai every morning. Beach was a couple minute walk away. Lots of great restaurants, shopping and things to do within walking distance or a short drive. The condo had pretty much everything we needed, so we didn’t have to go buy extra things. Deb and Larry obviously take great pride in their Hawaii home as it reflects in how well the have maintained it. We can’t wait to return! Thanks for choosing our condo, we hope you do come again, we love our return guests. Great facilities, the pool, SPA were so inviting, great proximity to the beach and activities. Staff was super helpful. Look forward to visiting there again. Thank-you. We would love to have you as guests again, no need to wait for an anniversary. Nice and clean. close to beach. Owners were easy t work with. the place was Nice and clean. great views and huge Lanai. will go back again. Wonderful one bedroom, two bath condo directly across street from beach park. 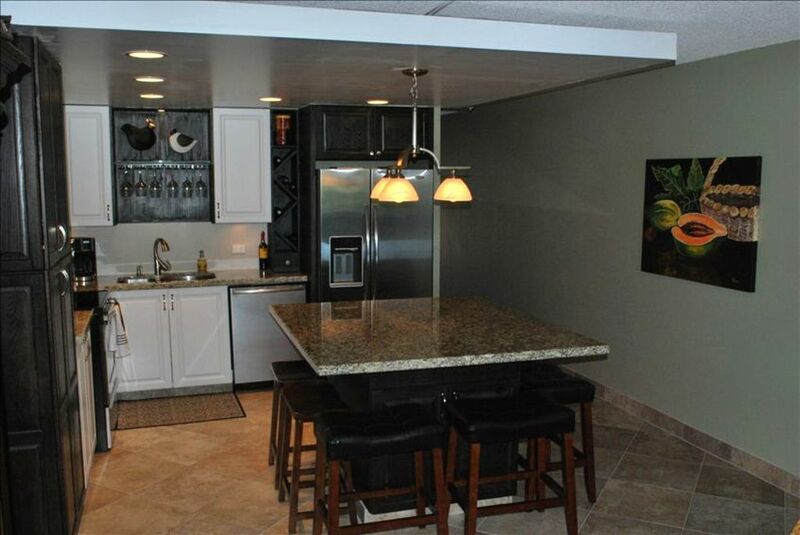 Condo has been recently updated with modern kitchen appliances, countertops and lighting. New washer and dryer in unit. Modern baths with new showers and fixtures (no bathtub). WiFi was reliable. Unit clearly used by owners with many extras available in unit. Unit was very clean and well equipped. Kamaole Sands is a large condo complex with a moderate sized pool. Pool has snack bar and planners for island activities. Several attractive barbaques on property with seating to eat nearby. Local owner’s representatives were nearby and immediately responded when we had trouble with key box on arrival. Many good restaurants, brewpubs and food trucks within 5 minute drive. Overall great first time experience in this location and would definitely return again. Thank-you for review, we are happy you enjoyed your time in our condo and as you stated, our winter home away from home. We heard the wifi has been iffy, this was due to a transition this spring for the whole complex from one provider to another. All glitches should be ironed out by now. I recall you are very familiar with Maui, so we're delighted you appreciated all that South Kihei has to offer. bocce ball played on the large grassy area at Kamaole 3 beach which is directly across the street. Whales guaranteed to perform off Kam 3 during the winter months. From Kam 3 one can walk south or west for several kilometers along the beach. Resort Fee of $36.46 plus a Registration of $25.00 is paid directly to the Resort upon check-in. Total: $61.46 US Check-out cleaning is guest's responsibility and IS already added to your total rental fee. $130.00 IMPORTANT: If you choose to use PayPal you must respond to an invoice you will receive from OWNER, do not pay VRBO or Homeaway, they only needed you C/C for their fee. They do not store your C/C info. The owner will need your personal email address to send the invoice. Late night flight? A Late check-out is possible if there is not a back-to -back guest. Ask owner and if available it is $80.00 US CANCELLATION & REFUND POLICY: The 25% deposit is NON-REFUNDABLE. Should a cancellation be necessary after paying in full, we will refund you for all nights that we are able to re-book, minus the 25% deposit.